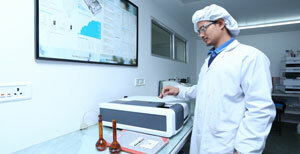 Taurus Pharma manufactures and markets Pharmaceutical products, to satisfy continuing needs of the customers. This is achieved by application of sound Quality Management System and adopting current Good Manufacturing Practices and complying with all regulatory requirements. While doing so safety of the employees, working environment, as well as natural environment is strictly maintained. The company is committed to manufacture products of high quality, which are safe for human consumption and have consistent efficacy of dosage form till the end of their shelf life. The quality assurance of its products is the obligation of the company and it makes available all the requisite measures and resources and all the departments of the company share it by keeping vigil while purchasing, maintaining, manufacturing, testing, distribution and marketing of its products.